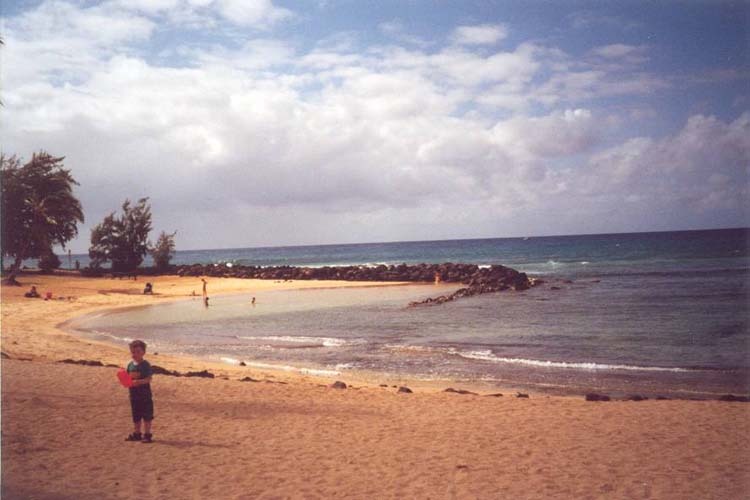 In May 2001 we traveled to the Hawaiian island of Kauai . We stayed at the Hyatt Poipu Beach - a wonderful location. On the plane we met another couple that had a 5 year old boy, and as it turned out, they were staying just down the street from us so we were able to get the boys together to play. We took a boat trip, snorkeled, swam, and ate a lot of great food. This page is a slide show - to start the slideshow click on the first thumbnail image you want to see, and then click on the current picture to advance to the next. Or you can pick and choose which pictures to see by clicking on them. Links will bring you to a more detailed page about the area. These spinner dolphins swam beside and underneath the bow of the boat. Alex at the children's swimming area of Poipu Beach. (It also had great snorkeling). Alex in one of the many hammocks at the Hyatt. Alex generally got very upset when we tried to take his picture - this one he actually requested! Lisa on our balcony. From our room we could see both the beach and the gardens/waterfall. Alex in the saltwater "lagoon". The lagoon had a gentle sloping beach and was quite warm. It was completely separate from the ocean (and even had different sand, rumored to be imported). Alex loves boats, so toward the end of our trip when we went to a Japanese Restaurant, we ordered the "Poipu Love Boat" especially for him. He was thrilled!